DemoCurmudgeon: The TrumpCare Patient Death Spiral!!! Proponents of the plan, led by Ryan (R-Wis.), have argued the total number of people covered is the wrong way to measure the law’s impact. 14 million people would lose health coverage next year alone, the report stated. Premiums would be 15 to 20 percent higher in the first year compared to the ACA, and 10 percent lower on average after 2026. By and large, older Americans would pay “substantially” more and younger Americans less, the report states. I'm also fascinated by the game of symantics; the health care coverage vs the health care they receive. My head is spinning from the contradictions; Republicans disagree with the CBO report, but agree with the CBO report that by 2026, premiums might be lower by 10 percent. So...which is it? Don't forget, the state risk pools were a disaster and mostly unaffordable to those who needed them. 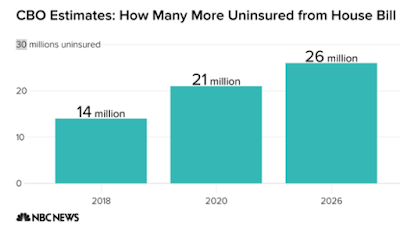 According to the CBO, an estimated 52 million people would be uninsured in 2026, compared with 28 million who would lack insurance that year under current law. ...but there premiums would be 10 percent lower...than what, already through the roof premiums? Does that include copays and deductibles? How does that work if healthy individuals don't buy insurance? Did CBO even think to look at health care before the ACA, because that's where we're going. The CBO also estimated that the GOP legislation would reduce the federal budget deficit by as much as $137 billion ― to $353 billion ― by 2025. Approximately 17,000 people could die in 2018 who otherwise would have lived if a House Republican health proposal endorsed by the Trump administration becomes law. By 2026, the number of people killed by Trumpcare could grow to approximately 29,000 in that year alone.